The Find It! 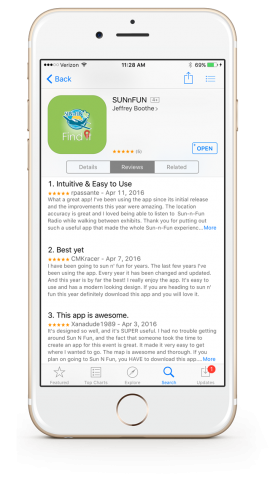 mobile app for SUN ‘n FUN 2016 #SNF2016 was a big success with over 3000 downloads and great ratings and reviews. FindIt! received 4.7 stars in the Google Play Store and a perfect 5.0 stars in the Apple App Store. The SUN ‘n FUN International Fly-in & Expo is the second largest airshow/fly-in in the country where 1000’s of pilots, planes and enthusiasts gather for a week every spring in Lakeland, FL. Find It! 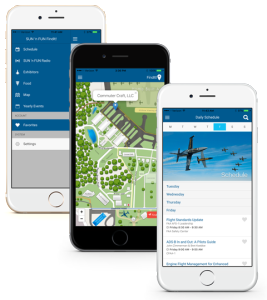 is a mobile app for iOS and Android that allows attendees explore over 1000 points of interest including, workshops, exhibitors, food and airshow schedules on a fully functional custom map. Users can browse, search, filter points of interest that are then pinned to a pinch-n-zoomable custom map of the 1 square mile campus. Tapping the “Find Me” button the map will pinpoint your position helping guide you to your desired location. Find It! can help you find ATMs, Camping Amenities, Coffee, Education Workshops, Food, Ice, Medical & First Aid, Restrooms, Showers, Tram Stops, and much more! You can even listen to live radio of Air Traffic Control and Airshow broadcasts. The app is built on the popular Ionic mobile framework that leverages Google’s world renown AngularJS Framework.